The ageing process is accompanied by a cellular accumulation of misfolded proteins. These misfolded proteins lead to the onset of many diseases associated with old age, including neurodegenerative and metabolic disorders such as Alzheimer’s disease, Parkinson’s disease, and diabetes. One factor that may be causative in this accumulation of misfolded proteins is a decline in protective cellular stress responses. 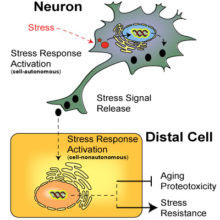 With a particular focus on the endoplasmic reticulum stress response (UPRER), we are interested in why this decline occurs, how it leads to neurodegenerative disease, and how the loss of stress responses can be remedied to improve health. In addition, an accumulating body of recent work suggests that stress responses act not just within cells, but also to initiate inter-tissue communication that allows protective responses to spread from neuronal cells to other cells throughout an organism. This provides a way to link the detection of stressful environments with integrated, whole-organism defensive responses. Using the nematode C. elegans as well as mouse models, we are investigating the ways in which neurons detect stress, the means by which stress responses are communicated between cells, and how interventions in this process might be utilized to treat disease. Systemic stress signaling: understanding the cell-nonautonomous regulation of proteostasis. Aging as an Event of Proteostasis Collapse.